The Kingsway District Association’s Annual Directory. This 60 page glossy directory will be available through businesses in the Kingsway district, through Edmonton Kingsway District events and tradeshows, and through dozens of high traffic locations throughout Edmonton. 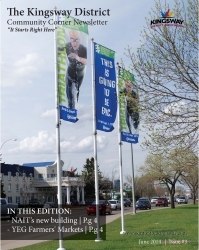 10,000 copies will be distributed throughout Edmonton and northern Alberta to give visitors to the area a convenient reference of the shops and services in the Edmonton Kingsway District. The QR code enables visitors, members & advertisers to read and navigate the product easily online. The directory establishes the Kingsway District Association brand and the businesses within it. The Kings way District Association helps their members to promote their business and other special events taking place in the Kingsway area. Currently the KDA has a Twitter program for restaurants whereas each weekday around the participating restaurant’s lunch features are tweeted out to the public. Twitter followers of @EdmKingsway will receive a message letting them know the lunch features of restaurants in the Kingsway area allowing them to choose where they would like to dine that day. If you would like to have your restaurant participate in the program, contact marketing@kingswaydistrict.ca or by calling the KDA office at 780-454-9716. Organizations and Business can submit material to the Kingsway District Association for marketing through Social Media. You can also “Like Us” on Facebook and have your friends and followers do the same. Materials submitted for special features and events going on in the Kingsway area, will also be posted on Facebook’s Edmonton Kingsway page. For advertising rates click here.